Greek PM Alexis Tsipras has threatened to resign over the result of a snap referendum on Greece's debt crisis due on Sunday. As the deadline nears, reports in Greece say a last-minute offer was made by creditors on Monday night. Speaking live on state TV on Monday evening, Mr Tsipras appealed to Greeks to reject the creditors' proposals, saying this would give Greece "more powerful weapons" to take to the negotiating table. 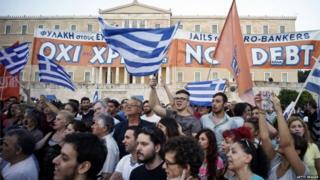 Tens of thousands of people gathered outside the Greek parliament in Athens on Monday evening in a show of support for the government's proposals. A rival protest organised by those calling for a yes vote is due later on Tuesday. Image caption Marusa, attending a no rally on Monday, says: "I believe in Tsipras and I'm not worried"
Some eurozone leaders, including the Italian prime minister and French president, voiced their concern on Monday that Greek voters would effectively be deciding next Sunday whether or not they wanted to stay in the eurozone. Meanwhile, European Commission President Jean-Claude Juncker said he felt betrayed by the Tsipras-led government and called on Greek voters to oppose him. Reports in Greece said Mr Juncker sent a last-minute offer to Greece on Monday night. The new offer is believed to have centred on a change in terms to Ekas - a top-up given to poorer Greek pensioners that Athens prefers to scrap by 2020, but Europe wants phasing out earlier. The Ekathimerini newspaper said Greece's government "listened with interest to what was being proposed" but rejected the offer. There are, however, indications in Greek media that the government is to discuss Mr Juncker's offer again over the coming hours. Greece's government has already been forced to order all banks to be closed until 6 July after the European Central Bank (ECB) decided not to extend its emergency funding. The ECB is believed to have disbursed virtually all of its ceiling for funds, amounting to €89bn (£63bn). On Tuesday, Greece's finance ministry said 1,000 bank branches would re-open from Wednesday to allow pensioners - many of whom do not use bank cards - to withdraw up to €120. "Should the agreement plan submitted by the European Commission, European Central Bank and the International Monetary Fund to the June 25 eurogroup and consisting of two parts, which form their single proposal, be accepted? The first document is titled 'Reforms for the completion of the Current Program and Beyond' and the second 'Preliminary Debt Sustainability Analysis'. The Athens stock exchange has also been closed as part of the emergency measures. The government said it would make public transport free in the Athens area for a week while the banks are closed. Stock markets in Europe continued to fall soon after opening on Tuesday, after closing down on Monday. But Asian markets rebounded, with stock markets in Tokyo, Hong Kong and Seoul all rising compared with the previous day.